The All Progressives Congress, APC, said Wednesday that the report that some senators were considering impeaching President Muhammadu Buhari was “laughable and a huge joke taken too far”. Some senators had on Tuesday threatened to move against the president, for his government’s decision to charge the senate president, Bukola Saraki, and deputy, Ike Ekweremadu, for alleged forgery. The APC said in a statement by its national secretary, Mala Buni, that the senators should not “allow political shenanigans becloud overall national interest”. 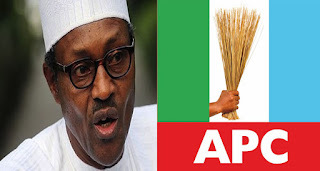 The attention of the National Secretariat of the All Progressives Congress (APC) has been drawn to media reports of a laughable impeachment plot by some Senators on President Muhammadu Buhari during Tuesday’s July 12, 2016 closed session of the Senate. This is a huge joke taken too far. The Party advises the Senators in question to stop this huge joke and concentrate on their primary constitutional responsibilities of lawmaking and discharging of their legislative mandates to their constituents at the National Assembly. The Party reiterates that the Senators in question (should) not to allow political shenanigans becloud overall national interest. The Party will not join issues on the Senate forgery suit and other court cases concerning some members of the 8th Senate because it will be sub judice. We advise the Senators in question to tow the same line and allow judicial processes run it normal and legitimate course. Repeated allegations that the court cases are politically-motivated by the President and the APC are baseless. The President Muhammadu Buhari administration strictly respects the principle of the Rule of Law and also adheres to the constitutional provisions of Separation of Power between the three arms of government. The APC urges Mr. President and the entire cabinet to remain focused in its effort to deliver on election promises and to steer the nation to its deserved heights.